Leading Manufacturer of peristaltic dosing pump and peristaltic dosing pump dispenser from Vadodara. We are one of the well-known manufacturers and exporters of Peristaltic Dosing Pump. The offered peristaltic dosing pump is largely used in food processing plants, chemical companies and pharmaceutical organizations. Our exported peristaltic dosing pump is designed to dispense, sample and filter the industrial fluids. The offered peristaltic dosing pump is available at very affordable market selling rates. 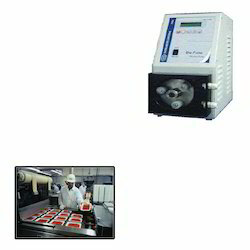 We are one of the surely understood manufacturers and exporters of Peristaltic Dosing Pump for Food Industry. The offered peristaltic dosing pump is to a great extent utilized as a part of sustenance preparing plants, concoction organizations and pharmaceutical associations. Our exported peristaltic dosing pump is intended to apportion, test and channel the mechanical liquids. The offered peristaltic dosing pump is accessible at extremely reasonable business sector offering rates.